However, those who will probably have the most fun in Turkey are foodies – the maddening mix of Eastern spices, Ottoman delicacies and Balkan dishes make Turkish cuisine one of the best in the world. 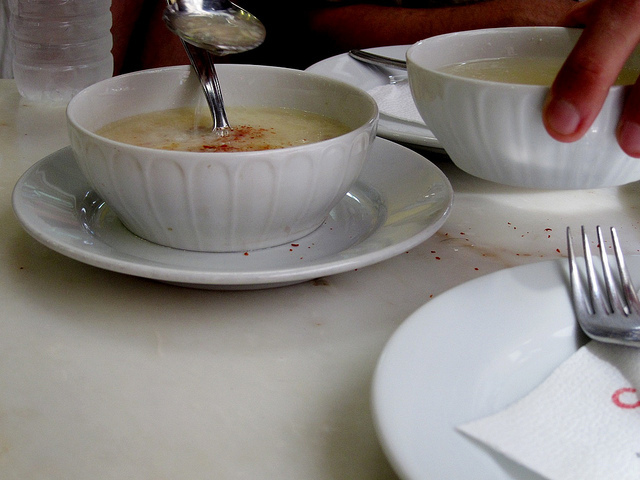 Here are 5 delights of Turkish cuisine that not even the pickiest traveler can ignore. Although many dishes in Turkish cuisine are meat-based, vegetarian travelers will not have to go hungry either. Yaprak Sarma is an amazing vegetable dish that comes very close to the Balkan stuffed cabbage rolls, but without the addition of meat. The rolls are filled with a mix of rice, onion, mint, currants, cinnamon and other spices. Yaprak Sarma can be found all over Turkey, in large restaurants as well as neighborhood joints, and it makes for a hearty meal that will give you a boost of energy. In the Balkans you have chorba, a sour and delicious soup, and in Turkey the local variation is called i?kembe, and it is made with lamb tripe. Although in the past it was a working class meal, i?kembe is one of the favorite national dishes in Turkey, and while you can sometimes find it in fast food restaurants, it is also consistently on the menu of pricier places as well. If you have partied a bit too much the night before, a bowl of i?kembe will patch you right up. 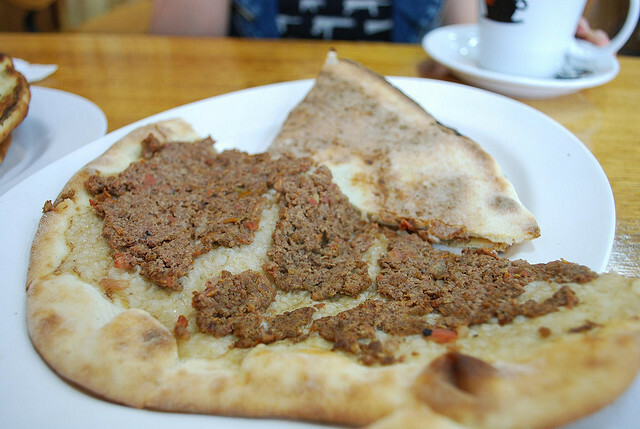 Lahmacun can be described as the Turkish version of pizza – it is a round and flat piece of dough topped with minced meat and onion. You can wrap your lahmacun around some vegetables and herbs like tomatoes, parsley and lettuce, squeeze some lemon juice on it and eat it on the go. This is the perfect Turkish dish if you’re in a hurry but you’d rather stay away from any junk food. Non-foodies would probably say that manti are nothing more than Turkish ravioli, but these tiny, stuffed dumplings are so much more than that. The small handmade dumplings filled with meat or vegetables are served topped with yoghurt, ground mint or ground sumac. One of the best kind of manti that you can find in Turkey are the Kayseri manti (popular in the city in Kayseri), which are very small and served with oil caramelized with tomatoes. 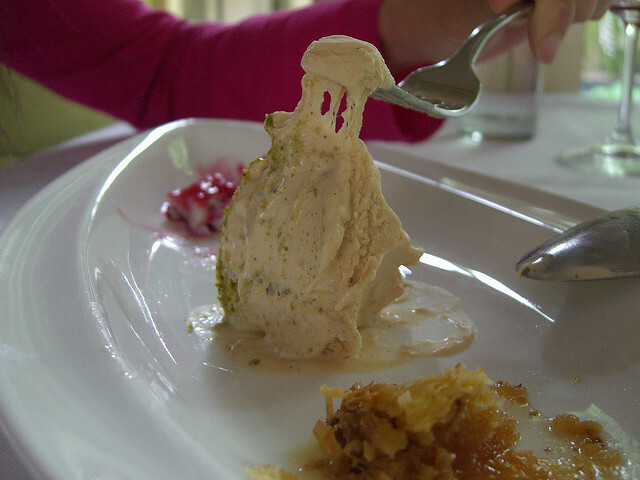 Dondurma is Turkish ice-cream, but it’s unlike any ice-cream in the world. Dondurma is has a distinctive texture and it doesn’t melt as easily as regular ice-cream, because one of its ingredients it salep, a flour made of the ground roots of a type of orchid, as well as mastic, a resin that makes the ice cream a bit chewy. Dondurma is found in stores and at street vendor’s – it’s really interesting to see how the vendors churn the ice-cream with long handles to keep it malleable.